Four Bridges is a sound installation designed to be heard by listeners over mobile devices as they walk through Montalvo’s woodland environment. It features children’s choir, instrumental music, readings of poetry, and archival recordings. 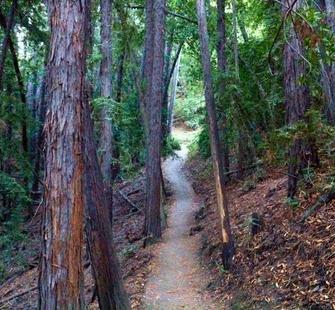 The walk, clearly marked by a series of signs, will take you into redwood canyons, through hardwood forests, and into open meadow vistas, before looping back to the starting trailhead; it takes about 26 minutes to complete. You should wear comfortable walking shoes. Combining instrumental music, the voices and laughter of a children’s choir, field recordings, audio clips from archival sources, and readings of poetry and prose, Four Bridges intersperses light, airy and playful interludes with sober passages and subject matter. Some of its most compelling material features the voices of victims of political and religious injustice, which call out from the twisted underbrush, first with poems inscribed by Chinese immigrants on the walls of the Angel Island Detention Center, then in the person of a Japanese-American whose father was interned during the Second World War, and finally in the reminiscences of a Holocaust survivor. Please Note: Some of the historical material included in Four Bridges may not be suitable for very young children. There are several ways to access the audio tracks. Some involve downloading, while others are available through preloaded MP3 players that can be checked out on the Montalvo campus during business hours. For anyone who takes the walk during business hours, the preloaded MP3 players offer a convenient and high-resolution option. You can skip down now to the link below that will direct you to the Box Office and tell you how best to use them. If you are planning to experience Four Bridges when the Box Office is closed, you will have to download the sound files to your phone. This can be done at home or at the Four Bridges start sign, using the Montalvo Guest Internet connection. Downloading at Montalvo takes between three and four minutes to complete. The links below will guide you through this process. Choose the one that best suits your device. The Bandcamp album provides the highest resolution files and is accessible to all devices. PLEASE NOTE: It’s very important not to walk too quickly. An easygoing, relaxed pace, especially slow during the second track, is important. Don’t be concerned if you are asked to advance to the next track before the current one has reached its end; there is extra material built in to accommodate a variety of walking speeds. It’s okay - and expected - that not all of that material will be heard.